Mykl Warwas owns and operates a guest house in rural Eveleth. One of the many attractions are the birding opportunities he and his family have encouraged on the property. Submitted photos. Any business owner discovers the importance of having the necessary knowledge of how finances, credit, and debt management converge in a business venture. Pairing this knowledge with wisdom allows the entrepreneur the opportunity to grow a thriving enterprise. Profit and loss are keenly felt when the budget is best described as “shoestring.” The majority of the population does not have millions of dollars to invest in a startup company. Instead, the greater number of small business owners tend to initiate businesses which revolve around a personal skill or talent, or the development of a product they feel would be in high demand. Whatever the driving factor, small business owners face financial challenges and lessons on a daily basis. Mykl Warwas runs a short-term vacation guest house. The rural Eveleth vacation rental has been in operation for about eight months, and is listed on the popular website Airbnb.com. In this instance, Mother Necessity had a say in the venture. 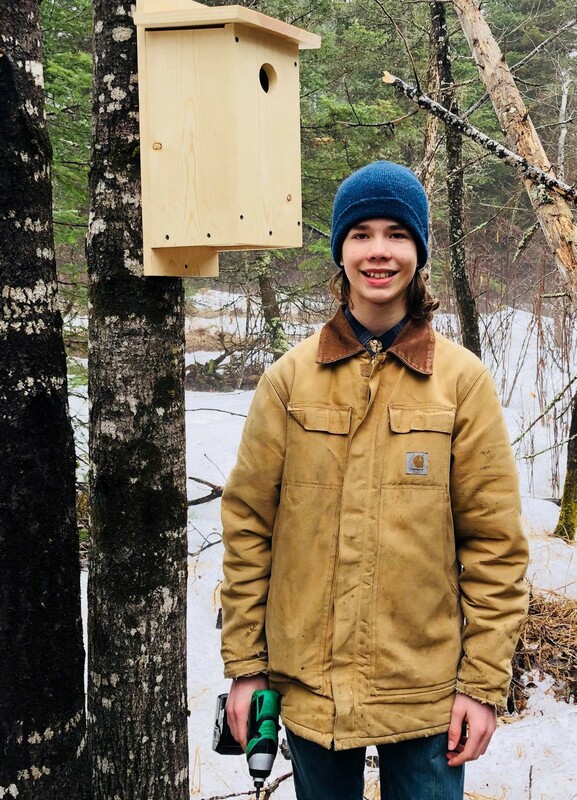 Nigel Warwas, 13, is a budding entrepreneur, specializing in species-specific birdhouses. Most of his guests come for family getaways, though some are in neighboring areas on business or are in town for special events. The guest house sits in the country just off Highway 53, on 21 acres. The Warwas family has worked hard to make sure the house is a comfortable home away from home for up to 14 guests. “It’s always neat to hear when guests have really enjoyed their stay,” Warwas said. “So many of our guests are birders.” The nearby birding destination Sax-Zim bog is one of the attractions to his location. 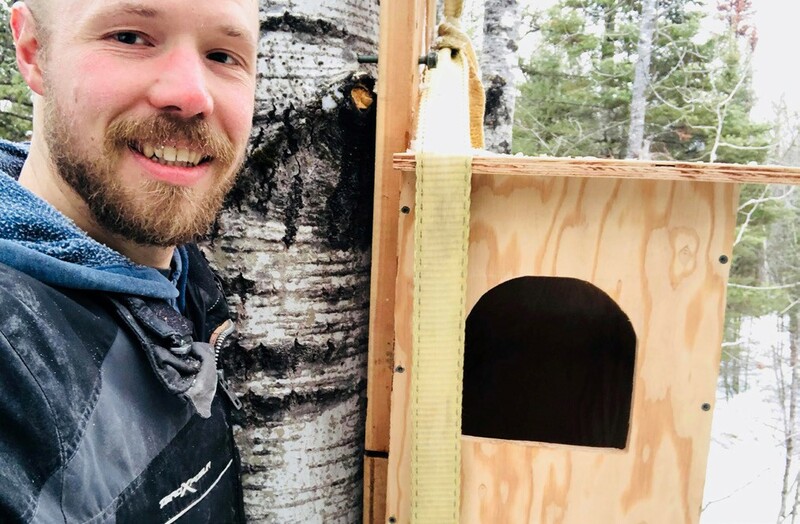 He and his family have built and installed birdhouses of various kinds on the property, which have the birds flocking to the guest house as well. “We have put so much effort into the wildlife on our guest house property, and as much as it wears us out many times, it sure is a lot of fun too,” Warwas added. So far, they have feathered visitors such as great gray and barred owls; redheaded, piliated, and hairy woodpeckers; red-breasted and white-breasted nuthatches; black-capped chickadees, robins, and more. Danyel Filipovich, owner of PLAIN & SIMPLE, offers oldfashioned homemade soaps. Her daughter, Dannie, and son, Jed, help at a local show. The birds have been influential not only in Warwas’ life – he grew up making birdhouses with his grandfather – but also in his son’s life. Brenna Kohlhase makes all natural soaps from fresh farm ingredients and essential oils, and teaches others to do the same. Warwas is not alone in learning how to balance cost and price of services and goods. Artisan-based businesses also fall victim to this price conundrum. Those business owners, like Warwas’ son, who work with their hands to produce a product find their true costs are never recouped. And like with a guest house business, time is the commodity most often left uncompensated. Business sense must be in the blood for some. Warwas’ sister, Danyel Filipovich, started her small business venture when she was a young woman. She owns PLAIN & SIMPLE, an old-fashioned homemade soap company. Ann Alaspa, owner of Grateful Hearts Family Kitchen, can be found at the Tower Farmer’s Market in the summer. “PLAIN & SIMPLE started when I was about age 17, so I’ve been doing it almost 30 years,” Filipovich said. Initially she started making soap to bring in a little extra money, but also because many people are allergic to scents, preservatives, additives, and dyes in commercial soaps. Even though the business name has been registered for 20 years, she has only recently begun soap production in earnest as an LLC. She makes simple soaps with a handful of ingredients you can pronounce. Her most versatile is a Basic White bar and is good for the whole body, head to toe. The Basic White can also be used as a saddle soap, a fabulous stain remover – it has removed every stain she has put to the test – and it’s good for poison ivy and poison oak. All of Filipovich’s soaps are made from the same three base ingredients – water, tallow, and lye. In addition to the Basic White, she also produces four other types of soap bars: oatmeal, pine tar, pumice, and goat’s milk soaps. The best part? The goat milk comes from her own goats, which are raised on her rural Eveleth farm. 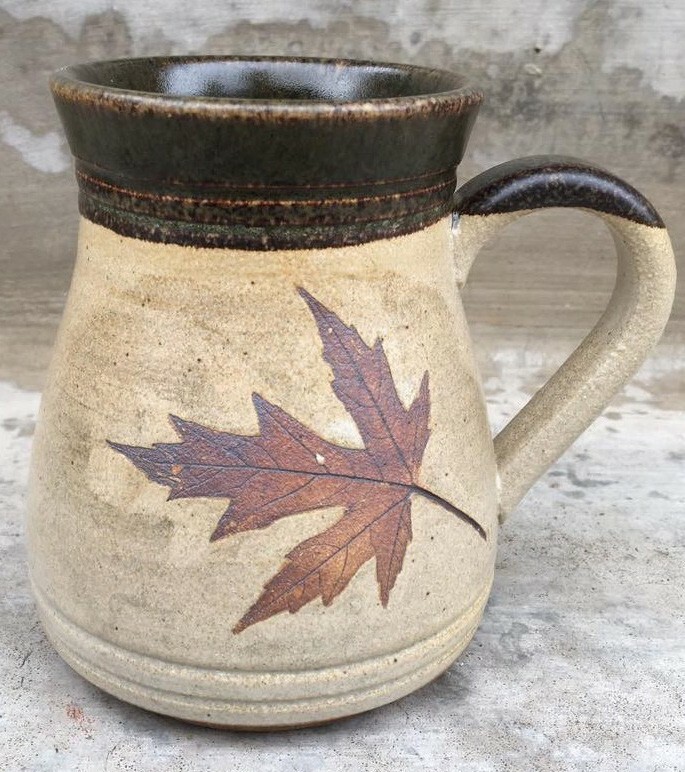 Lisa Wagenbach, owner of Daybreak Pottery, specializes in nature-themed mugs and other useful pottery pieces. Filipovich is passionate about producing a basic soap that works well for everyone. As with any artisan business, though, the financial side has to find balance with the product. She has faced challenges, especially in acquiring the lye that goes into her soaps. Where it was once easily obtainable at the grocery store, lye has to be shipped in large quantity to her home and ordered specially. Another lesson has been in pricing her product. 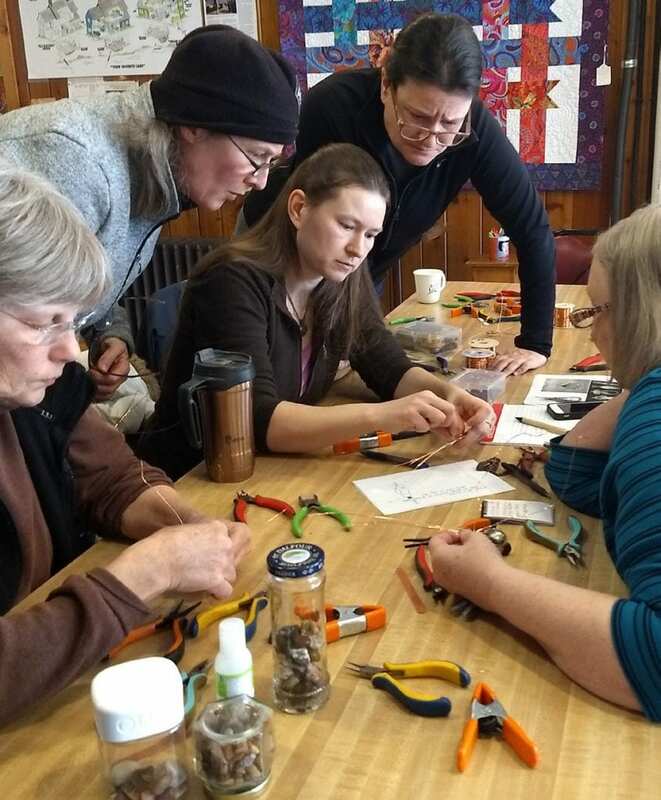 Jewelry-maker and owner of Hook and Stone Creations, Liz Engelke (center), teachers a wire jewelry class. “I have a hard time charging enough,” she admits. Her soaps are $5 per bar, and she charges a flat rate for shipping, no matter how many bars are ordered. Pricing is not the only test she faces. “Now, the ongoing issue is finding an insurance company that will cover soaps.” Filipovich continues to seek an insurance policy that will cover skin irritation. Filipovich takes her PLAIN & SIMPLE business to area events like Old School Lives and the Iron Range Home Show. She will have her back-to-basics soaps at EarthFest, and at the Miner’s Memorial Building vendor show during the Land of the Loon weekend. 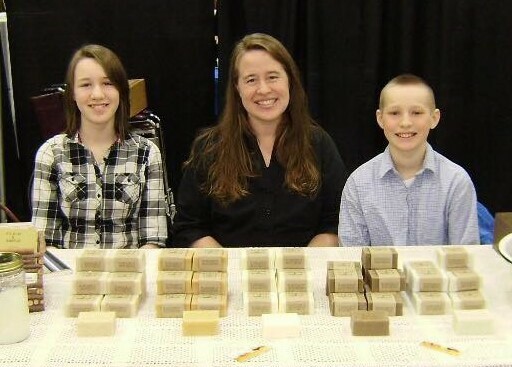 Brenna Kohlhase of Virginia is another avid soapmaker. She started making soaps 22 years ago when her family began to experience skin issues and allergies with commercially made soaps. 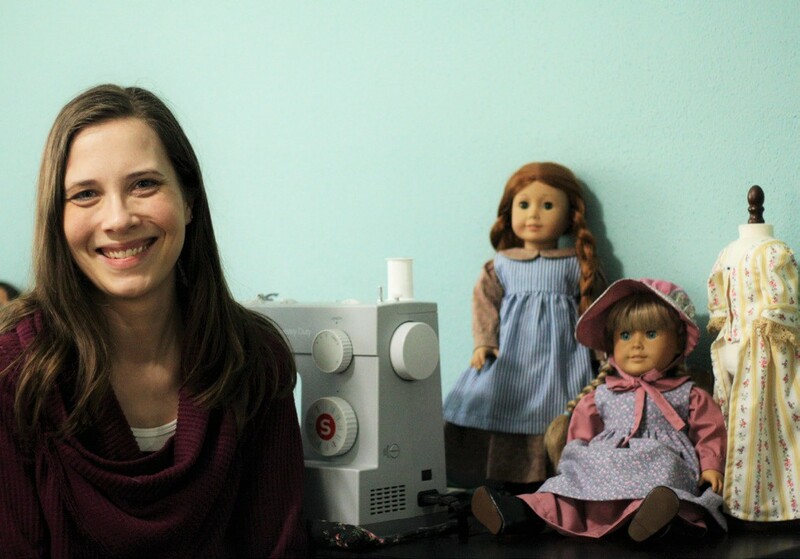 Sarah Samson sews and sells historical, literary-themed, modern, and timeless doll fashion designs in her Etsy store. 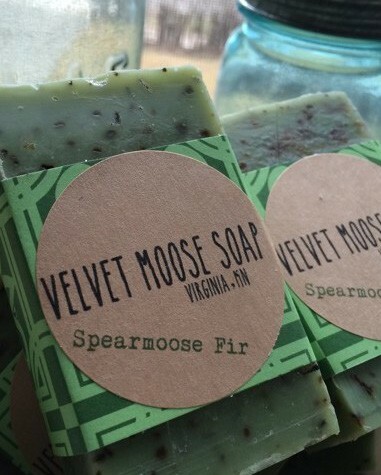 Kohlhase experimented to get her brand – Velvet Moose Soap – just right, and began gifting them to friends and family. After that, she sold at holiday boutiques out of her home, and eventually was approached by Natural Harvest in Virginia to sell through them. She has sold wholesale goods to a few local stores, and participated in farmers markets in Ely and Tower for about 10 years. Kohlhase now teaches how to make soap at Natural Harvest and the Ely Folk School. She recently drove to a western Minnesota working farm to teach eight ladies to make homemade soaps using ingredients they have produced on their own farms like goat’s milk, honey, fresh eggs, tallow, and home-grown herbs. Artisans have the blessing of doing what they love. Successful artisan businesses are built on both a love for the craft and a dedication to making sound financial decisions. Ann Alaspa is a baker from Embarrass, and she owns Grateful Hearts Family Kitchen. 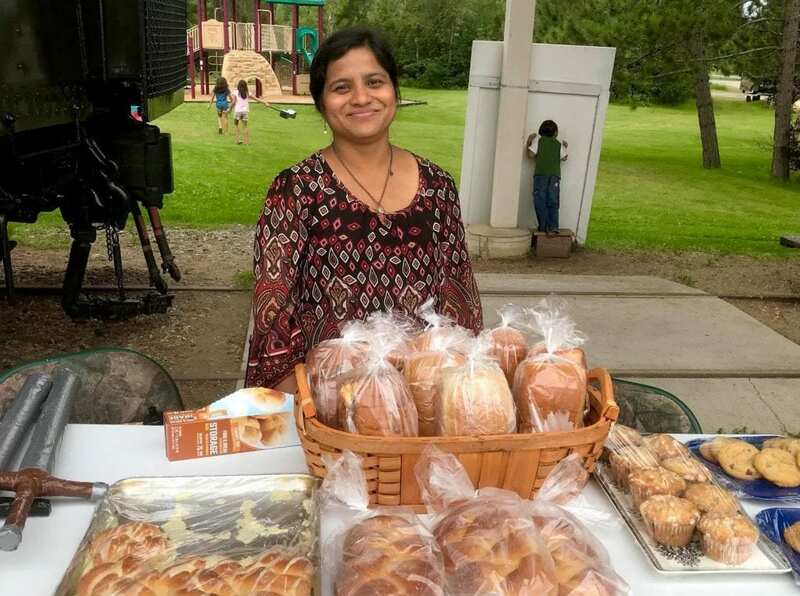 Her baked goods business started in 2015 as a way to help fund a trip to her home country of Myanmar (Burma) for her and her family. Grateful Hearts Family Kitchen has a selection of products, including breads, cookies, scones, cakes, some gluten-free treats, jellies, jams, and varieties of kimchi and curry powders. For most artisan business owners, family plays a major role in the motivation for success. The venture may spring from a specific need, like Alaspa’s desire to see her family across the world. Other times, it comes from a mother’s desire to be home with her children rather than be employed outside the home. “I felt like I was missing out on my children’s childhood because I was working all the time, and when I was home I was rushed, busy trying to catch up on housework and meals and feeling stressed out,” said jewelry-maker Liz Engelke of Soudan. Engelke owns Hook and Stone Creations. She makes wire-wrapped, micro-macramé, and hemp jewelry which she sells through her Etsy store online. Engelke also sells her creations at Ubetcha Antiques & Uniques in Tower, and at Birgit’s Jewelers in Brainerd. For her and many others, the business is also an investment in her family. “I want to work from home so I can be home for my children, and I can teach them all the little things I’ve learned along the way. Hook and Stone has been a side business without a steady income so far, but I’ve decided to put the work in to make it so that I can work from home,” Engelke added. Lisa Wagenbach of Sauk Rapids also knows about family as a driving force in creating an artisan business. She owns Daybreak Pottery, and makes and sells beautiful, functional pottery pieces. For the last 12 years, Wagenbach has incorporated her love for nature and her spirituality into her pottery. Local small business owners and artisans are a throwback to simpler days. From hospitality to soapmaking, jewelry-making to pottery and sewing, crafty Iron Range entrepreneurs are determined to bring financial success from their talents and passions. Be sure to offer your support to them by taking note of their contact information. Mykl Warwas – On Instagram @mykls_ guest_ house or at his Airbnb listing: www.airbnb.com/rooms/27635019. Danyel Filipovich – PLAIN & SIMPLE Soap – www.plainandsimplesoap.com or 218-750-0463. Brenna Kohlhase – Email kohlhase@mchsi.com to schedule a soapmaking class. Ann Alaspa – Find Grateful Hearts Family Kitchen on Facebook, or email gratefulheartskitchen@gmail.com. Liz Engelke – Hook and Stone Creations at www.etsy.com/shop/HookNStoneCreations or on Facebook. Lisa Wagenbach – Email Daybreak Pottery at daybreakpottery@yahoo.com. Sarah Samson – Find Nan Chenille Doll Fashions at www.etsy.com/shop/nanchenille, or on Facebook and Instagram. Jennifer Osufsen lives in Aurora with her husband and hooligans and is an independent author in addition to writing for Hometown Focus. You can connect with her online through Facebook, her website www.jenniferosufsen.com, or email jennifer@htfnews.us. She welcomes your feedback!